The Sheep and Wool Festival was last weekend, and it seems like a very long time ago already. I wish I had blogged about it earlier so it would all be fresh in my mind, but I think that the photos and captions below do enough to convey what kind of weekend we had. If you’d like to see more images of the cabin where we stayed, and the festival itself, I do have a Google Photos album that you are welcome to look at. So glad you enjoyed your trip even with the cold room to start. You made the best of it with your warm knits and good attitude!! Beautiful photos during this time of year. 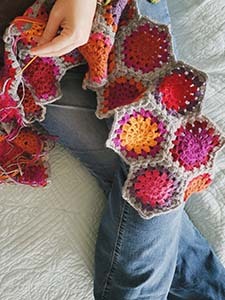 Your pretty hitch hiker shawl makes me want to start one and love your choice of color. Your work place reflects your happy nature! !